I was leary as this garden season progressed. Everything but the weeds seemed to move so slowly, and the lack of nice orderly rows gave me heebie-jeebies galore. But the garden is coming on strong, and has become something of a delight to behold. Production has just truly begun, as the carrots now outpace the peas and cilantro – oh, that crazy productive cilantro! I’ve scattered seeds along the neighboring lot border to allow it to continue in its claim of the land. New insects appeared this year by the multitudes. Squash vine borer was the most obvious, and my vines were not covered. I identified the entry spots on the main pumpkin vine and applied a plaintain weed poultice at every point after snapping off a few of the leaves and vine branches. Each hole was covered with plaintain poultice. That was a month ago and I’ve not seen more than a few yellowed leaves at the primary site. We’ll see if that was a success. The plantain grows prolifically in my yard, and I’ve been using it on bites, most recently on a bite that had necrosis (yes, brown recluse spiders are resident here). The bite healed completely. My thought was ‘why not’ when I considered its use on the plants. Below is a sampling of the beauty and diversity I’ve discovered in the garden this season. I’m making this post my last – as I’ve determined it’s simply time. Time to use my time elsewhere. Thanks for being along for the ride! This blog will stay live, but no longer active. Gearing up for Spring, and dreaming of gardens and growing and harvest, reality comes crashing in and sets the tone. That reality washed over me as I posted my recent activity in my garden journal. 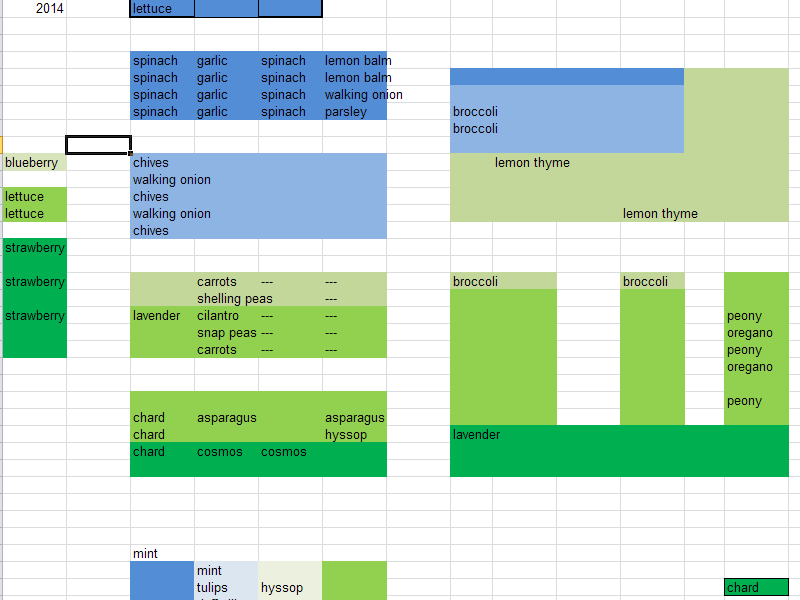 I use an Excel spreadsheet to track what I plant and when and how it progresses, with notes to mark target dates, spacing and sunlight needs. I use a new sheet for each garden year, copying the previous year and revising it to start the new season. Distracted from this progress by a newly discovered idea, I had been engrossed in creating a garden plot on a separate sheet in the workbook and forgot to start my new tab. Last night, I copied the tab – realizing that I was copying from the previously noted season of… 2011. I’ve had a rough couple of years, and I was very aware of that fact. I just hadn’t realized how drastically it had affected my garden plans until last night. The past few months have been busy with bursts of organization, purging, and planning. Activities that had been lacking for the most part during these years evidenced as missed tabs on my garden journal. I was stirring last year, laying down a plot for a permanent garden, plotting about how to attract beneficial insects, and setting down ideas for permanent plants. It’s time now. Time to sink some roots. Time to take hold of the time I have available and figure out how to do things I need to do. Time to start gettin’ busy. My favorite version: when I use oregano and onion and garlic fresh from the garden, home-cooked beans, and pasture-fed chicken roasted at home. Heat the oil in a large pot on medium high; add onions and sauté for 10 minutes. Stir in the garlic, chilies, cumin, oregano, and cayenne and sauté for 2 minutes. Add the beans and chicken stock and bring to a boil. Add the cooked chicken and cheese and stir until the cheese melts. This soup freezes quite well! Simply thaw it in the refrigerator overnight and reheat when ready to serve.